Marvel Studios has been bringing out big, fun superhero movies for several years now, and they’ve reached the point where viewers can trust that a Marvel flick will be a good time, regardless of whether you know the source material. “Guardians of the Galaxy” banks heavily on the Marvel brand, since it focuses on a fairly obscure group of heroes most non-comic fans have never heard of. Fortunately, Marvel has proven once again that it can be trusted. “Guardians of the Galaxy” is a big summer movie in all the right ways. It includes familiar tropes, but mercilessly skewers most of them. It presents us with a group of protagonists who are all either antiheroes or deeply strange (or both!). And it works. There’s no grittiness here, none of the grim-dark miasma DC has been banking on so heavily in its Batman and Superman franchises. This is a movie that aims to be pure fun, and mostly succeeds. The ostensible protagonist of the film is Peter Quill (Chris Pratt), but he gets taken down at least one or two pegs almost every time he tries to follow in the shoes of his obvious inspirations, Captain Kirk and Han Solo. His attempts to flirt with assassin-turned-antihero Gamora (Zoe Saldana) repeatedly fall flat, his inspiring speeches stumble and get cut off at the knees, and he’s generally made to look ridiculous at almost every turn. Pratt is a master of physical humor and of playing the likeable loser, so casting him in the part is inspired. He makes Peter easy to like, even (perhaps especially) when he’s doing something stupid. When he accidentally comes between the supervillain Ronan (Lee Pace) and an orb containing unparalleled power, Peter has to team up with an unlikely crew – first to save his own hide, then to save the galaxy. There’s the pair of bounty hunters who tried to capture him; Gamora, who until recently worked for Ronan; and Drax (Dave Bautista), who wants vengeance upon Ronan for wrongs in the past. 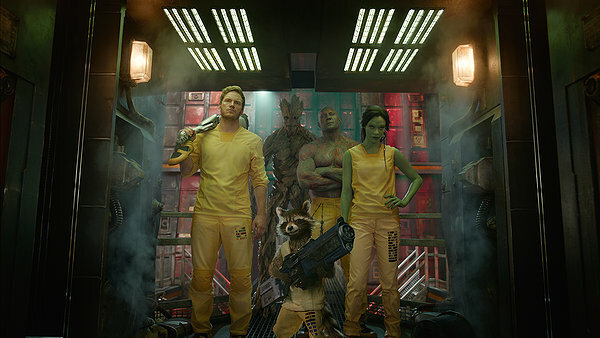 The bounty hunters are Rocket (voiced by Bradley Cooper), a cybernetically enhanced raccoon who not only walks upright and talks, but has a big attitude and loves machine guns, and Groot (voiced by Vin Diesel), a tree creature who is both surprisingly powerful and surprisingly sweet given the every-critter-for-themselves attitude most beings around him have. It’s a testament to the quality of the special effects that it’s very easy to accept Rocket and Groot as real, in spite of their being largely created out of thin air and computer wizardry. Drax is the ultimate straight man, and Bautista plays him solidly. Drax’s people are completely literal, and he is so consumed by his desire for revenge that petty details like other people’s feelings are irrelevant to him. The script gives us a lot of laughs and is mostly very well-crafted (there’s a line when Drax refers to Gamora as a “whore,” which doesn’t make a lot of sense if he’s being 100% literal), and the actors inhabit their characters so fully that there aren’t many moments to take you out of the action movie trance. The special effects of the film in general are very good – there are lots of beautiful shots of outer space, and plenty of well-crafted explosions. Like many of the other Marvel films, there’s a thread of seriousness underlying all the fun. Peter’s trauma from his mother’s death plays out in the subtle character arc he’s given (somewhere a film student is writing a paper about this, no question); Rocket has a surprisingly sad core behind his brash and angry exterior; Ronan’s motivation is provided by decades of war between his people and the people of Xandar. The moments dedicated to these more serious topics give us a momentary respite from the thrill-a-minute action material, and help the pacing not to feel too frenetic. Overall, “Guardians of the Galaxy” is a promising new entry in Marvel Studios’ franchise of films. If you love action/adventure movies and space exploits, this is a great flick, right up your alley. Fans of the comics will have the same issues to contend with as in the other Marvel films, and should plan to attend or avoid accordingly. Folks disinterested in action, sci-fi, or silliness will be better served elsewhere.